While doing some Stoddard related research on the internet, I came across the website for the US National Archives. One of the branches led me to information on Gunfire Support missions during the 1967 & 1968 Vietnam War Period. Gunfire information for the 1965 cruise was not available. You can find the original records here . From this data I created spreadsheets that provide visibility to the gunfire missions of the USS Stoddard during these periods. The data also shows that the USS Stoddard actually had 4 additional firing missions after the hit. Thanks to the good work of the crew in making the Stoddard operational. I had also read the press release provided by John Rauh regarding the need to cool the 5” barrels down in the Nov 7, 1968 firing mission so I have highlighted that event in the 1968 Document. From the data found for the day of February 8 and March 17, 1967 and the new capability of Google Earth I created a map that shows the actual location of the target and my guess as to where the ship was located when we took the hit from the shore battery. 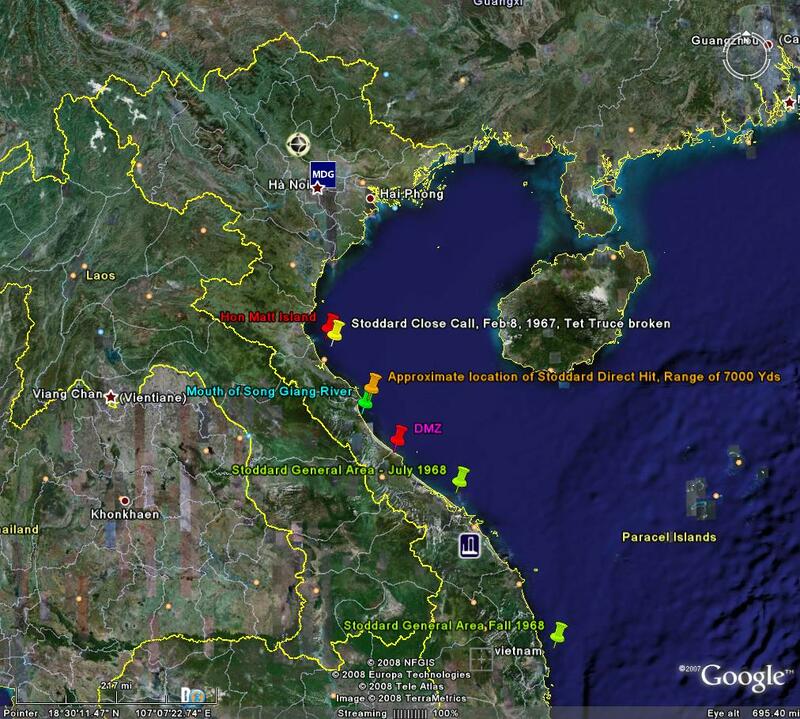 I also included points for the area of the close call we had on the first day of the Tet Truce on February 8, 1967. It appears to be in the same general area where we took the hit. In addition, a Wikipedia history of the USS Stoddard referred to the direct hit event happening near the mouth of the Song Giap River. After extensive research, I now believe this should be the Song Giang River. It is this river that correlates to the UTM gunfire coordinates for both the Stoddard and the USS Ingersoll –our sister ship. I included in the 1967 document an excerpt from the monthly military press release dated March, 1967 that describes this event but I believe their location is also in error. It describes the event as 9 km north of the DMZ when it is actually 90 km. A newspaper article describing the close call event is here (well coming soon). The USS Sumner DD-692 website provides another account of this event as “Shortly after the February 8-12 Tet truce - marred on its first day by an exchange between the Stoddard and a coastal artillery site on Hon Mat Island near Vinh...” This location does correlate to the UTM grid coordinates logged in the original records for the Stoddard. This event is further described in the Feb, 1967 monthly military press release for Feb 1967 – which I included the excerpt of, in the 1967 document. All of the points for these events can be viewed in the Stoddard Hit and Close Call map to the right. 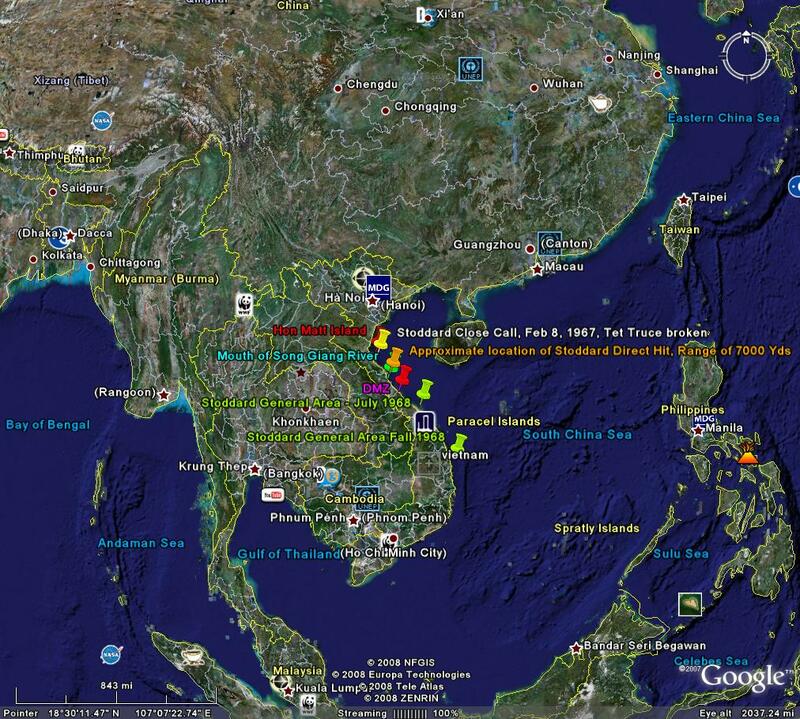 And for a wider view of the Gulf of Tonkin select The Stoddard Vietnam Wide Area Map. If you have downloaded the Google Earth programs use this file called Google Stoddard Overall to see the beach and take a tour of the Vietnam coastline. This will include the Stoddard locations. The views of the DaNang area and other cities are in very high detail. Instructions for using are the following: Hover over the title above, Google Stoddard Overall and right mouse click. Select Save Target As then Save to a know location such as Desktop. Double-click on filename.zip and it will open to filename.kml. 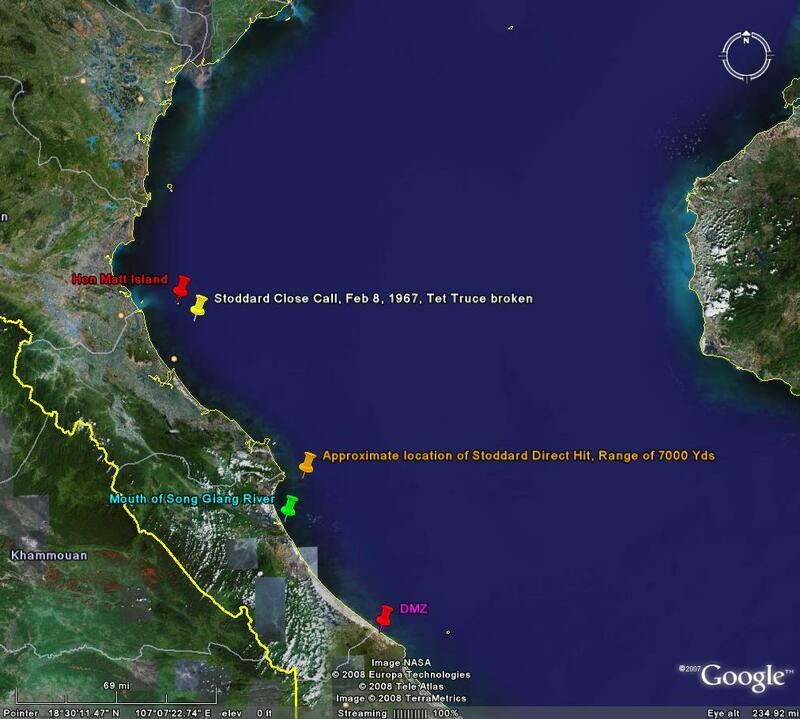 Double-click on filename.kml and Google Earth will open up to the coast of North Vietnam and you will see the flags along the coastline where these Stoddard events took place. If Google Earth is not loaded on your computer, find that download site here. It's worth the effort. Admiral Conolly talked to us at the 1993 Charleston reunion about the time that Stoddard came under fire and took a direct hit from a shore battery. While no major injuries or fatalities were incurred the ship did sustain some damage. He took great pleasure in relating to us the story of how the Stoddard was able to return at a later date. She bombarded the site and knocked out the guns that hit the Stoddard. Conollys deceased now, but is there a record of a return trip shelling the same coordinates? The 1968 report did not contain coordinate information – just general areas. If this event occurred, it was likely done in July while the Stoddard was in the general area of the DMZ and before Captain Connolly was relieved by Captain Lacy in Sasebo. It is also possible that the 1968 gunfire records are not complete, as I did find an additional 2 firing missions for 1967 that was not in the records but was in another military report. Perhaps we have an eye witness out there that can help us answer this question more fully.